The director Kurt Hoffmann came to Erik Charell after the examination as an unpaid trainee through his father. The first contact to the film business was done and it didn't last long till Kurt Hoffmann was engaged as an assistant director. Especially for director Reinhold Schünzel he was engaged for a total of nine movies. Among others he was involved in the movies "Viktor und Viktoria" (33), "Die englische Heirat" (34), "Amphitryon" (35) and "Das Mädchen Irene" (36). Apart from three short movies where he was in evidence as a director - "Wochenendfrieden" (38), "Der Skarabäus" (38) and "Andere Länder, andere Sitten" (38) - he carried on the job of an assistant director. Kurt Hoffmann's first movie as a director came 1939 into being and was called "Paradies der Junggesellen". 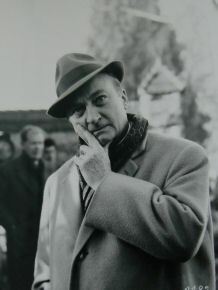 The leading role was played by Heinz Rühmann with whom he shot a total of seven movies, among them their greatest common success "Quax der Bruchpilot" (41) as well as "Ich vertraue Dir meine Frau an" (43). At abaout the end of World War II he had to enter the military and was taken prisoner. He was only released in1946. After his return to Germany he shot his first post-war movie "Das verlorene Gesicht" (48), an earnest movie with a great Marianne Hoppe in the leading role. In the 50's he came back to the comedy movies and realised some very huge successes like "Hokuspokus" (53) as well as "Das fliegende Klassenzimmer" (54) and "Drei Männer im Schnee" (55) by Erich Kästner. Kurt Hoffmann got the top of German directors when he shot nine more movies from 1955 with his discovery Liselotte Pulver from the movie "Klettermaxe" (52) which all achieved an enormous popularity in Germany. To their well-known common movies belong "Ich denke of an Piroschka" (55), "Die Bekenntnisse des Hochstaplers Felix Krull" (57), "Das Wirtshaus im Spessart" (57) and "Das Spukschloss im Spessart" (60). Kurt Hoffmann wasn't able go on in the 60's from formes successes and he retired gradually from the film business. To his well-known movies of the 60's belong "Die Ehe des Herrn Mississippi" (61), "Dr. med. Hiob Prätorius" (64), "Rheinsberg" (67) and "Morgens um sieben ist die Welt noch in Ordnung" (68). His last work as a director was the TV serial "Sonntagsgeschichten" (76). Besides countless awards, among others several Filmbänder in Gold of the German Filmpreis, he also was one of few German directors who were achieved with the Golden Globe for his movies "Bekenntnisse des Hochstaplers Felix Kruss" (57) and "Wir Wunderkinder " (58).